Skynet516 has unleashed another Mortal Kombat 9 video. This time the uploader isn't posting combos. Instead, a Test Your Luck run is done with Sub-Zero. Straying away from combos this go-around, Skynet516 has decided to have a run with Sub-Zero on Test Your Luck mode in Mortal Kombat 9. 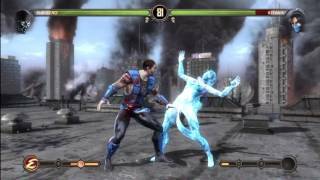 The clip sees Sub-Zero face numerous opponents with various challenges thrown his way.